Much like any other working professional, I'm always on the lookout for shoes that look chic, classy and are super comfortable. And given how much I'm vary of wearing heels, my eyes are always searching for the perfect flats. Enter Mubo shoes, a boutique shoe brand based in South Mumbai and boy, do they have a fact collection or what?! And when I say fancy, I don't mean the burn-a-hole-in-your-pocket kind. I mean something you can afford and would love to spend your money on. I opted for their classic Victoria Mules in a baby pink tone with intricate work on top. Over the last couple of months, they've truly become one of my go-to shoes. I've paired them with different outfits all of this while- once a totally professional pant-shirt look; once a really cute midi and the other time slightly more ethnic with a pair of palazzo pants and a kurta. Now here's why I call them my go-to shoes: you can literally start and end your day in them. Doesn't matter whether you're at work, at a party or on a dinner date, these shoes suit every occasion. And they're sturdy as hell (I know because I'm infamous for the number of times I trip and fall). Also the best part is that they're just priced at INR 2,000. Apart from the mules, they have a wide range of wedges, block heels, flats, and so much more. 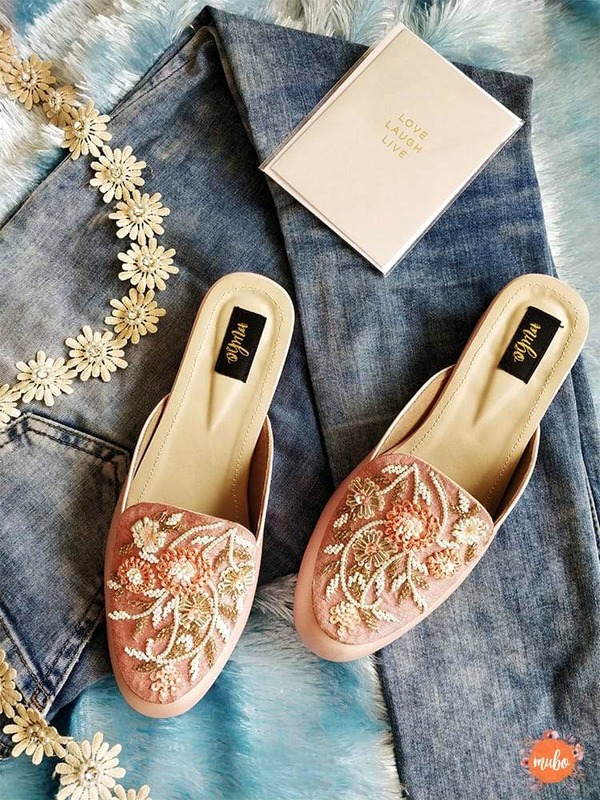 Their most expensive pair will cost you INR 2,000 (yes), so if you're a shoe-lover, this space is like a candy shop- let out the child within you. While you can order the shoes online, Mubo Shoes also has a home-run studio at Malabar Hill, where you can only go with an appointment. So make sure you book a slot in advance.